Japanese Knotweed (Fallopia Japonica) is, on the face of it, an elegant and attractive bamboo like plant, but in the past few years it has developed a reputation for being one of the most antisocial and talked about plants in Britain and is described by the Environment Agency as "indisputably the UK's most aggressive, destructive and invasive plant". It has a very invasive root structure and the strength and speed of its growth means it can damage buildings, roads, flood defences, drains and other buried services, and also smother other plants. This has led to its inclusion in the Wildlife and Countryside Act 1981, making it an offence to plant or otherwise allow Japanese Knotweed to grow in the wild. Japanese knotweed did not arrive by accident – it was intentionally brought here! It was introduced into Europe in the early 19th century and propagated and sold as an ornamental garden plant because it grew quickly and because in its native Japan the plant is well behaved. In Japan its proliferation is kept in check by natural means; at least 30 species of insect and 6 species of fungus feed on the plant. It only became a nuisance when it was removed from its natural habitat where these biological control species do not exist and, with no natural predators, the plant can thrive.However, quite quickly the Victorian gardeners recognised its antisocial behaviour, with the Royal Horticultural Society advising caution on using it in the early part of the 20th Century. However, it wasn’t until sometime later that it was identified as having a destructive quality to structures and other plants. Why is this now a problem? Once it takes hold, Japanese Knotweed grows at a very rapid rate. It isn’t fussy. It can grow in any type of soil. Above ground it can grow to 3-4m high in just 10 weeks in dense strands. Underground, the plant has an aggressive root system with interlinking rhizomes (used to store food) that grow rapidly. These can spread up to 7m horizontally and the energy and force of this rapid growth can break through solid barriers, compromising the physical integrity of structures such as patios and paths, outbuildings and conservatories and drains and other services. Although rare, it has been known to break through the floor screeds and into a property. The main way in which it spreads is by human activity. Essentially any part of the plant can, if broken off, grow into a new plant. The most usual way is for rhizomes to be broken off and spread onto new areas simply through careless management of the waste. In particular it has been associated with water courses (streams, rivers, canals) where the water has inadvertently carried plant waste to a new site. Once established, the eradication of the plant can be problematic and expensive. Digging it out can work but due to the depth and spread of the rhizomes re-growth often occurs. Chemical treatments can take upwards of three or four seasons before total eradication is achieved. In addition to this, the disposal of what is now deemed as ‘controlled waste’ needs to be carried out under the Environmental Protection Act 1990. Essentially, this means a specialist contractor should be appointed. Implications for the home owner As well as the potential damage that Japanese Knotweed can cause, there are a number of other serious issues that a home owner needs to consider. First of all many buildings’ insurance policies do not cover repairs or the removal of Japanese Knotweed. Thus many home owners may not be covered for any damage caused or the removal of the knotweed. When knotweed originates from a neighbouring property an insurance company may pursue the owner of that property for the costs of the damage or removal. Thus a homeowner may find themselves liable for the costs of knotweed on a neighbouring property. Many mortgage lenders will not grant mortgages on properties affected by knotweed which can have obvious implications for owners hoping to sell their property. So have you got a Japanese Knotweed problem? Japanese Knotweed is an herbaceous perennial, meaning the stems of the plant dies down to soil level each winter but some parts of the plant are sustained just below or at surface level, meaning re-growth can occur for an indefinite number of years. Unlike many other plants in the UK it does not produce viable seeds as there is no male Japanese knotweed partner, but instead spreads through the root system or via stem cuttings, as mentioned above. The plant is bamboo like in structure with shield shaped leaves. These leaves are arranged in a zig-zag pattern along the stem and in late summer they will be accompanied by creamy coloured flower tassels. The stem can vary (depending on the time of the season) from being speckled, to a pinkish/red hollow stem, and then finally long bare stems in the winter months. 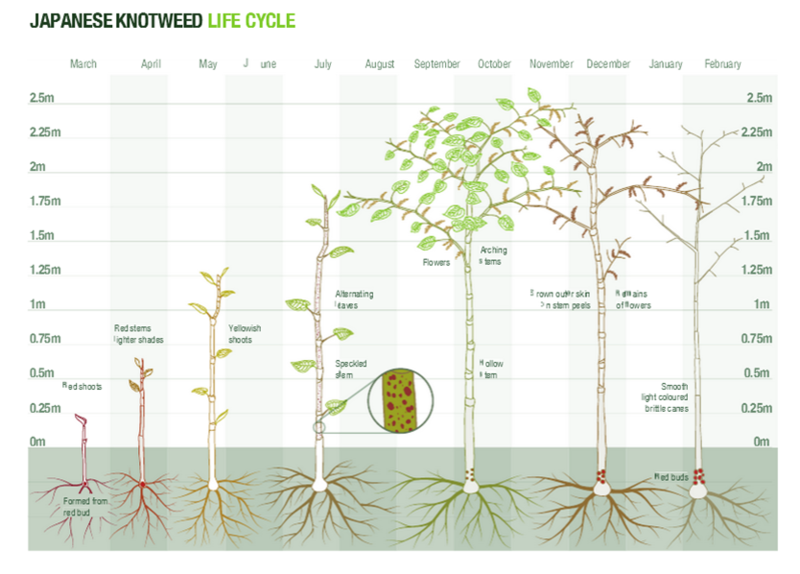 Below is the annual life cycle of Japanese knotweed. Do your bit to help: if you notice Japanese knotweed around your house, surrounding areas or anywhere on your travels then note them to Plant Tracker (http://planttracker.naturelocator.org/), a site dedicated to identifying and combating the spread of ‘the UK’s most problematic invasive, non-native plant species’.